The Scottish government has called for Scotch to be defined in UK law in order to protect whisky exports after Brexit. 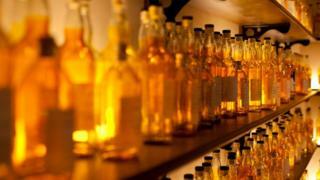 Scotland's Economy Secretary Keith Brown has written to UK ministers calling for protection of the Scotch whisky industry. The industry is worth about £4bn to Scotland in exports. An EU definition of whisky currently protects sales from sub-standard products. The UK government said it would support the industry so it continued to thrive. Mr Brown's call follows International Trade Secretary Liam Fox's visit to the US last week. The economy secretary said: "Aside from being a key part of Scottish culture and identity, our whisky industry supports around 20,000 jobs. "The US made clear in the Transatlantic Trade and Investment Partnership discussions that they would support a relaxation of the definition of whisky, which would open the market up to a number of products which do not currently meet that standard." He added: "It is vital that we continue to have robust legal protection of Scotch whisky, which is why I have sought clarification from the UK government as to whether Scotch whisky featured in discussions during last week's trade visit by the Secretary of State for International Trade. "I am also demanding that the current EU regulations are guaranteed post-Brexit. "After reports this week that the UK government is contemplating trade deals that threaten the value and reputation of Scottish produce, once again we can see the confusion which is at the heart of the UK government's Brexit position. "We need to be sure that any future deals work for Scotland and are not threatening the livelihoods of our farmers and producers." He said all four UK governments should have oversight of the negotiations to ensure, as far as possible, "that the right outcomes for everyone are secured". A UK government spokeswoman said: "Scotch is a UK export success story and we will support the industry so that it continues to thrive and prosper post-Brexit. "The UK government has a strong relationship with the Scotch Whisky Association and is working closely with the industry as we aim to secure the best possible deal for the whole of the UK."